PSA: We have just seven YBC Mantra Boxes in stock! Pre-order yours now while you still can! Hey everyone. Before you judge , just know that my first thought was ew, too! But wait, do you know why it’s something you should have in your kitchen? There are many health benefits to chicken liver. It’s a good source of Vitamin A which is great for eye health. It is a high source of protein and folate which is great for fertility and helping prevent birth irregularities. Liver is also a rich source of Vitamin B-12 and iron to give you a boost of much needed energy. Side note: (it is advised that pregnant women do not eat liver because too much Vitamin A can harm the baby). Give this recipe I found on ThePrimalist a try and who knows, maybe you will love it and have another nutritional staple to add to your fridge. 1. Chop the shallots or onion. Place the shallots and thyme in a fry pan with butter. Cook for 5-7 minutes or until the onions are soft. Once cooked, place them into the food processor. I used my vitamix as the food processor. 2. Rinse off your chicken livers. Cut out any veins or connective tissue that might be within your livers. Pat dry and place them in the fry pan with a good amount of butter so the livers won’t dry out during the cooking process. Cook the livers until they are no longer pink in the middle. 3. Transfer the cooked livers to the food processor with the shallots and thyme. Process the ingredients together, adding your 1/2 cup of butter one cube at a time until the mixture is smooth. 4. Add the milk (or in my case, I used homemade yogurt because Candace came through the kitchen and drank the last of our milk! ), salt, pepper and nutmeg. Process the mixture until ingredients are evenly distributed. 5. Transfer your liver spread to a container and place in the fridge for at least 2 hours to cool. 6. Once chilled, the liver pate is ready and will spread well on breakfast toast or can be used as a mid-day snack with celery, carrots, or cucumber. Cheers! 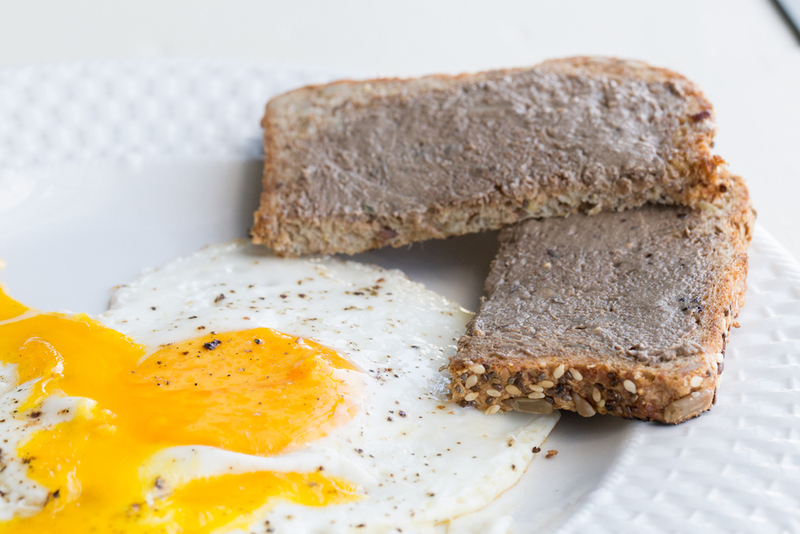 Liver pate on toast with an egg.